Oregon AFL-CIO endorsed candidates did well in yesterday’s election, see the list below to see who won yesterday. For all other races, please click here to see the results, and click here to read a breakdown of the union members who won their races. NOTE: Oregon House District 43, where we endorsed Roberta Phillip-Robbins, remains too close to call at this time. 1. Working people needs a raise. Working families are struggling to pay the bills and the middle class is shrinking. Working people have helped corporations rack up record profits, but we are not sharing in the benefits. 2. Restoring overtime is necessary to ensure that working people get paid for all the hours we work. One of the reasons why paychecks keep falling behind is because too many people can be forced to work overtime at no extra pay. Under the new rules, more people will get paid time-and-a-half whenever we work more than 40 hours in a week. 3. Restoring overtime will give millions of families a pay raise. Restoring overtime is the single most significant step the administration can take to boost wages for working people. If the new rules are what they are rumored to be, 4.2 million people will be newly eligible for overtime pay and another 8.9 million people who are already eligible will be able to prove their eligibility more easily. Restoring overtime will help working families climb the economic ladder and break into the middle class—especially women, African Americans, Latinos and millennials. 4. Restoring overtime will create jobs and increase the hours for people who work part-time. Even opponents of restoring overtime admit it will create more jobs. To get around paying time-and-a-half, many employers will choose to hire new employees—or allocate more hours to their part-time workers—and pay them straight time. 5. Restoring overtime will help the economy grow. Restoring overtime will put more money in the pockets of working people, and we will spend that money in our communities and set in motion a virtuous circle of more investment and more hiring. It’s working people, not the wealthy few, who drive economic growth. 6. Overtime protections have eroded since 1975. 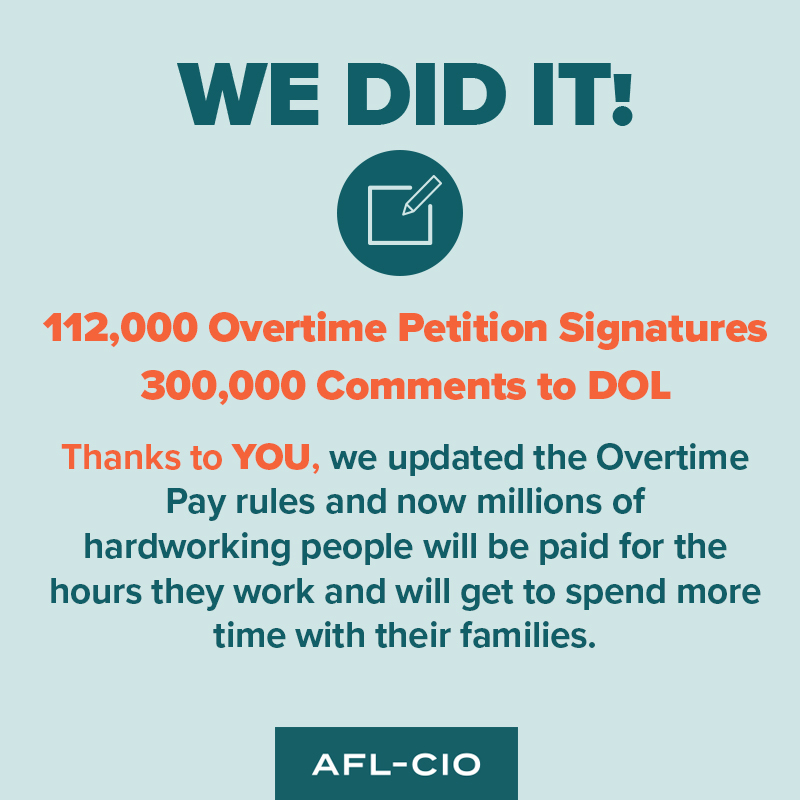 The whittling away of overtime protections is one of the ways the rules of our economy have been rewritten to favor corporations over working families. Even with these new rules, the share of people who are automatically eligible for overtime pay (regardless of their job duties) will still be lower than it was in 1975. 7. Restoring overtime will give people more time away from work. There is overwhelming evidence that overtime protection is effective in preventing overly long work days. Under the new rules, fewer people will be forced to work long overtime hours for no extra pay. Reducing excessive hours will make working people healthier and more productive. “New overtime protections mark a major victory for working people that will improve the lives of millions of families across America. The new rule more than doubles the salary threshold, ensuring workers who make less than $47,500 are eligible for overtime. We applaud the Obama Administration heeding the call for action to ensure working people get paid for all the hours we work. Taking this step to restore overtime is one of the many ways we are beginning to change the rules of our economy that are rigged in favor of Wall Street. The fight for even stronger overtime protections and to raise wages for all working people continues. But today, millions of workers will receive a long overdue raise, healthier and more productive jobs, and more time to spend with our community and loved ones. American CEOs Make 335 Times More than the Average Worker?! 335. In 2015, the CEO's of America's largest companies made 335 times the average American worker. We don't know about you, but to us, that seems extreme, especially when so many working families are struggling to put food on the table. Frankly that's just wrong. These high paid CEOs feed off of the low wage economy, and in some ways are compensated for creating it. Some CEOs are rewarded for outsourcing good jobs to countries with weak workplace rights and poverty wages. They get millions in bonuses for shifting taxable income to island nations. We pay our fair share in taxes so why shouldn’t multinational companies? In fact, the tax burden has shifted dramatically in recent decades and the burden is on us. By exploiting loopholes in the tax code, these multinationals leave our community budgets starved. We shouldn’t have to worry about water cleanliness, bridge safety or if our public schools have the resources they need to educate our children. Check out paywatch.org. 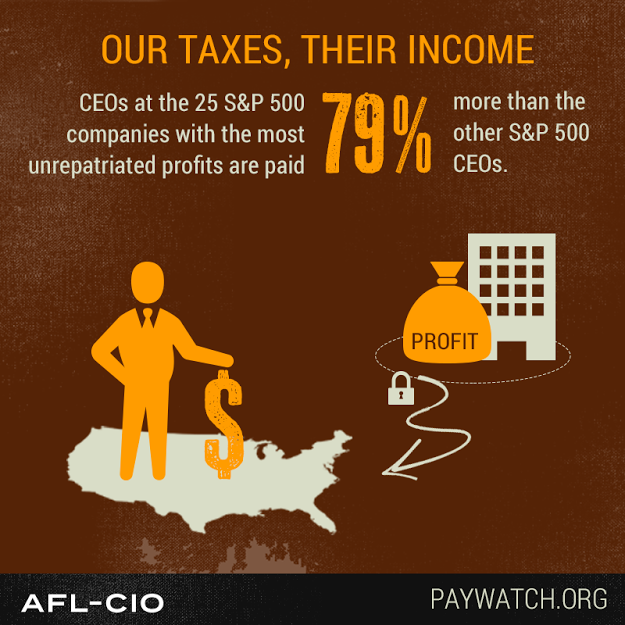 You'll see how CEOs take advantage of loopholes for their own selfish gain. And you’ll meet Mary, who has held several jobs that ended up outsourced to other countries, and the CEOs who employ these community damaging tactics.